Sea otters, like almost any animal that is exposed to frequent human disturbance, can become habituated to humans. Habituation results in a loss of fear of humans, increased boldness and in some cases aggression towards humans and pets. 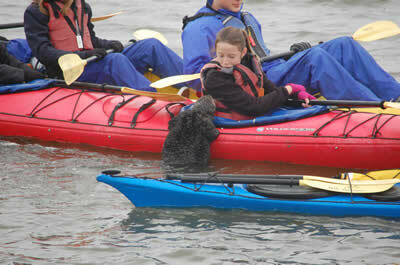 Habituated sea otters may try to interact with humans by climbing on kayaks. In scenarios like this, both humans and sea otters are at risk, and every attempt should be made to prevent physical interaction (see Avoiding direct interactions between sea otters, humans and pets). Interactions between sea otters and dogs should never be allowed. 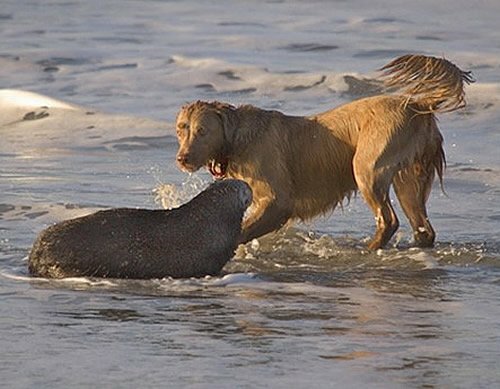 A dog can harass or injure a sea otter, and a habituated sea otter can easily kill a dog, whether in “play” or out of aggression. Direct interactions with sea otters also carry the risk of disease transmission from the sea otter to you or your pet. You or your pet may also transmit disease to the sea otter. A habituated sea otter can be dangerous, and incidents of aggression towards people or pets are likely to result in the removal of the individual from the wild population. When should I report harassment of sea otters and to whom? If you witness any incident (Level 1, 2 or 3), please help Sea Otter Savvy study disturbance and harassment of sea otters by completing our Disturbance Incident Report. This is not an official report to law enforcement, but is a vital part of our effort to collect detailed data on these incidents. Look for summaries of these reports on this site. In addition, Level 3 (Most Severe) incidents should ALWAYS be reported to law enforcement. Level 2 (Severe) incidents may also be reported, but enforcement action is facilitated if you include video or photographic evidence of the disturbance and some way to identify the perpetrator (e.g. boat (CF) number, vehicle license plate, physical description of person and/or boat).